Teleflora, one of the leading floral delivery service in the US, announced the unveiling of its new Winter Holiday bouquet collection with the launch of “The Teleflora Table,” an experience centered around the idea that families should be together at the holidays. 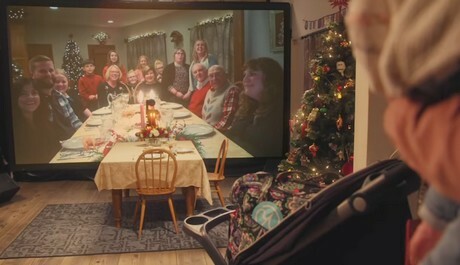 Through the power of 4K projection technology, floor-to-ceiling screens, and a meticulous recreation of a family’s dining room, Teleflora orchestrated a surprise holiday meal experience to reunite a military mom based in Tokyo with her loved ones halfway around the world in Omaha, Nebraska. Teleflora captured the scene with a 90-second short-form video featuring Captain Jennifer Bromm and her ten-month-old daughter Bailey experiencing her first Christmas. Bailey wouldn’t get to spend the holidays with her cousins and grandparents in Omaha, so Teleflora brought Omaha 6,000 miles to Japan. Launching today across YouTube and Facebook, the video campaign celebrates families near and far coming together during the holidays — no matter what stands in their way. Unbeknownst to Jennifer, Teleflora worked with her parents and husband, Jason, to transform a studio space in Tokyo into a replica of her parents' home in Omaha where the family traditionally gathers for holiday meals. Every last detail was accounted for, from her family's dishes and tablecloth, to the decorations on the walls. The menu was also carefully curated to taste, feel, and smell just like home, with mom's turkey and cheesy potatoes. To complete the experience, a floor-to-ceiling screen was erected and, using 4K projection technology, Teleflora connected two family tables on entirely different continents. "Our new Teleflora campaign spotlights the gift of being together and sharing those special dinner table memories, traditions or moments with family during the holiday," said Jeff Bennett, president, Teleflora. "By reuniting Jennifer with her extended family through the use of technology, we helped create an intimate dinner celebration while surprising the entire family with the holiday memory of a lifetime." The video was developed by The Wonderful Company's in-house creative team, Wonderful Agency, and the project was led by Executive Creative Director Amber Justis. "Today, we see a lot of families separated by circumstance, and it's hardest during the holidays," said Justis. "Our idea came to life when we found a way to bridge that gap by combining all the sights, sounds, tastes and memorabilia from Jennifer's childhood home in Omaha and transporting them to Tokyo. Teleflora delivered even more than beautiful flowers — we delivered a feeling." "The Teleflora Table" is an extension of Teleflora's overarching "Love Out Loud" brand platform, which launched during Christmas 2017. Whether your loved ones are near or far, Love Out Loud and surprise them with something as unique as a Teleflora arrangement. This holiday season, gift-givers can bring joy to their family and friends with a thoughtful, one-of-a-kind gifting experience that is ready to be enjoyed the moment Teleflora's special flower delivery arrives at the door. 2019-03-26 Is FTD really going to go out of business?